What is the Ecological Reserve? The La Jolla Underwater Park and Ecological Reserve consists of several habitats, including rocky reefs, sandy flats, kelp forest and two underwater canyons. Kayaking in La Jolla is a great way to explore the unique habitats that comprise the La Jolla Ecological Reserve. Call (858) 454-1010 to book a tour or rent a kayak or save money booking online. 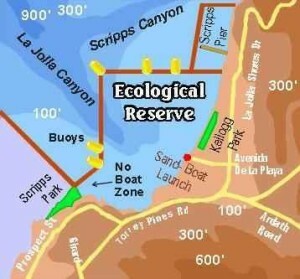 Kayak in the La Jolla Ecological Reserve! The San Diego-La Jolla Underwater Park and Ecological Reserve spans about 6,000 acres of ocean bottom and tidelands, from Scripps Park at La Jolla Cove, north across La Jolla Shores to the end of Torrey Pines State Reserve. As a “look-but-don’t-touch” ecological refuge, the park is an ecological haven and has become a popular destination for snorkelers, scuba divers and kayakers. We invite you to explore the La Jolla Underwater Park and Ecological Reserve by joining us on our guided Kayak Tour of the 7 Caves to respectfully explore this area. Kayak rentals are also available for experienced kayakers to paddle amidst the La Jolla Ecological Reserve. The Underwater Park was designated by the City of San Diego in 1970 and has two other parks within it: the Ecological Reserve and the Marine Life Refuge. The gentle slope of the ocean floor in La Jolla Shores combined with the rocky reefs help keep the waves small and minimal, making the La Jolla Ecological Reserve ideal for beginners to learn kayaking, snorkeling, and scuba diving in La Jolla. Marine life can be seen from our kayaks within the Ecological Reserve. San Diego Bike and Kayak also guides snorkeling tours or rents snorkel gear for those who want to get a little bit closer. Marine life includes: dolphin, leopard shark, garibaldi, sea lions, shovelnose guitarfish and more. The kayak tour is a great way to see all the wonderful marine life that reside in the La Jolla Cove, without having to put on snorkel gear and get in the water. Ocean kayaking is fun for all ages, and no experience is necessary for our kayak tours. Call (858) 454-1010 to reserve your spot or save money booking online. This 533-acre ecological reserve was established in 1971 and added to 10 years later. It covers all of La Jolla Cove to a point midway on the La Jolla Shores beach. Distinctive buoys mark the outer perimeter of the reserve. Within the reserve, other buoys mark a boat-free swimming zone and a 5-mph zone. No fishing or scavenging is permitted within the reserve. Starting from La Jolla Shores, the ocean bottom slopes gently out to sea. The reefs keep the waves minimal, making this an excellent entry point for divers and kayakers. The kelp beds also aid in keeping the waters within the La Jolla Ecological Reserve relatively calm. Beyond the gentle slope of the ocean floor right off of La Jolla Shores, there are two underwater canyons. La Jolla Canyon drops to about 600 feet and is filled with marine life. This may be why whales can be seen migrating so close to shore during the winter. The Scripps canyon is about one mile long and joins La Jolla Canyon offshore. Scripps canyon is a very deep submarine canyon with very steep vertical walls. The deeper Scripps canyon gets the steeper the walls get. The walls start at about 80 feet deep, but continue down to about 200 feet. The axial depth of the Scripps Canyon is about 1,000 feet. Scripps canyon is located near the Scripps Institute of Oceanography, a highly regarded oceanography research center, and is therefore one of the most-studied underwater canyons. Scripps canyon is also a popular site for recreational divers, because of its vertical walls and high density of marine life within those walls; however, diving Scripps Canyon is considered an advanced dive.